Friday, I met up with a great group of bloggers for dinner at Zapatistas. Fab Ellis was in town for the weekend and invited her Bloggers Like Me sisters to join her for dinner. My outfit for the evening included a 2 piece self sewn jersey dress. I made it a few years ago. It's from a Dolce & Gabbana pattern. Naturally I had to use leopard print fabric. Last seen here. I wore a camp shirt over it because I wanted to add some color and have more coverage. Wedge sandals are 9West and I'm carrying my thrifted Fendi bag. I haven't seen it in a while. Rediscovered it while unpacking! Earlier that day, I had time to paint nails and instagram it. V took a 2 hour nap!! I love this post! I had such a great time. It was so nice meeting you and I completely appreciate you taking us back to the hotel! Everyone looks so pretty! And it looks like you all had a great time! Love love love it! You all looked great & I'm super jealous. We had a #BLM meetup here as well. I love meeting new people. We had a great turn out and the food was great! Love this - thanks for sharing ! love it baby. 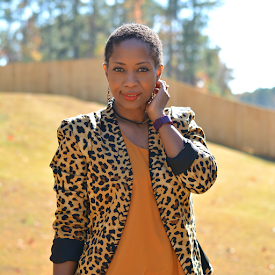 you can NEVER have enough leopard print. obviously! You look great, love your outfit! O, how I'd love to get out for a night! Great group of pretty ladies! I adore your outfit too! #BLMGirls rock! Awww look at us. Yay us ;) had a ball!!! so fun! and what a great dress! you look amazing! Love! You ladies look great! It looks as you ladies had such a good time! And what a great opportunity to be able to meet some fellow bloggers in person! Great choice of outfit for the night, can't believe you sew that dress! 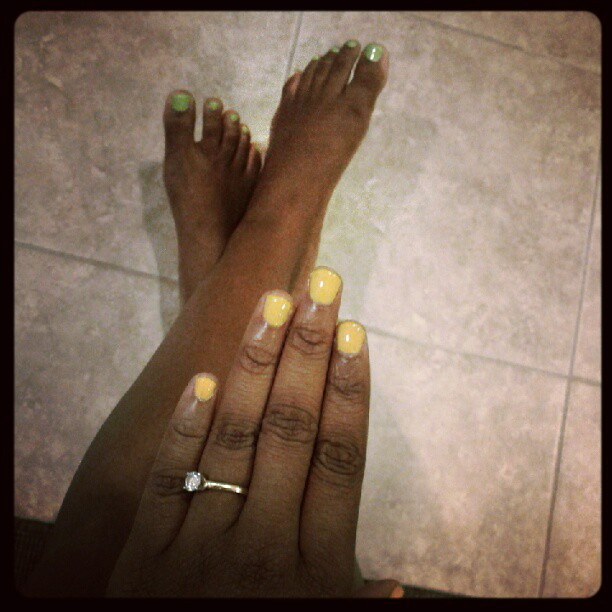 And I love that combo of green and yellow on your nails! Thanks Ashley. Nice meeting you too! Thank you! I hope there will be more meetups and maybe 1 big one with blmgirls from all over. I love meeting new people too. I'm reading all about how awesome ATL was. I have to get over there so many fabulous events. Thank you! Mom's night out is the best! You never know...I love to travel! It was fun. Must do it again. Thanks Jenny! It was a wonderful night. *hugs* back at you. Thanks for stopping by! That leopard dress looks fabulous on you!!! !